For new users, you can download the VCO Enterprise+ from Play Store and then purchase the VCO Enterprise+ license license key from ShareIt. If you are using VCO Pro, VCO Tab, VCO Pro+ or VCO Tab+, you can add the multiple client sync and subfolder sync features by purchasing the VCO Enterprise Extension license key. Please make sure you have updated to VCO build 181 or above (see VCO Settings). You will receive an email from ShareIt with the license key. Please register the key in VCO Settings screen. After registering with the key, you should see a new icon called Groups in VCO Main screen. As it involves multiple PCs and folders, it may be a bit complicated when comparing with VCO Pro. Please read the online help below and the examples. 3: Sync items between two Outlook clients, one of them syncs from PC to phone only. 4: Sync items between three Outlook clients, one of them syncs from PC to phone only. 5: Sync items between three Outlook clients, and two devices. Please also download the latest SyncCenter or above from our website. The license key is per device basis. If you have more than one devices and want to upgrade all of them to VCO Enterprise, you need to purchase the extension key for each of them. However, it's not necessary to upgrade all of them to VCO Enterprise if they don't need to sync with sub folders, you can sync Outlook clients with VCO Pro, VCO Tab and VCO Enterprise (see Example 5). They can be co-exist. By default, SyncCenter syncs items from default folders to VCO on your phone. When you create a new item in VCO, the item will be synced to the default folder in Outlook. If you want to sync items in more than one folders, in SyncCenter -> Sync Options -> Folders (Notes, Tasks, Calendars or Contacts), check the checkbox "Sync Selected Folders", you can select which folders you would like to sync. Under the Folders tab, there is an option called "Primary Folder", when new items synced from your mobile device, they will be created in the "Primary Folder". By default, the primary folder is your outlook default folder. You can change it to other non-default folder. For duplicates issues, when new items are synced from mobile device, SyncCenter will only check for duplication on the folder which the item is going to be created on. For example, if you have a contact called "John" which will be synced to your default folder, SyncCenter will only check if there is any existing contacts in your default folder with the name called "John". If you have another contact in other folder also called "John", that contact will not be considered as duplicates by SyncCenter. After sync, for this case, you will see two contacts call "John", one in the default folder, the other one in other folder. Similarly, if you have two items in Outlook called "Peter", but in two different folders. If you selected to sync these two folders, after sync to your mobile, you will see two contacts in your device called "Peter", but belong to two different folders. You can sync items from VCO to more than one Outlook clients. You can also sync the items from one Outlook client to the other Outlook clients on other machines. When sync with multiple machines, by default, only items in the primary folder (which can be set in SyncCenter, by default, it's your default Outlook folder) will be synced to the other machines. The items in other folders will only be synced to your mobile device, but will not sync to the other machines. That's , after sync with all the PCs, the items in default folders in all Outlook should be the same. To sync items on other non-default folders to other machines, you need to link the folders together to form a group of folders (Group). For example, you can link the folder A on Machine A to the Folder B on machine B and Folder C on machine C. This will form a group with Folder A, Folder B and Folder C. Items that you created in these folders, no matter on which machines, will be synced to the other folders in the group. That's, items on these three folders should be the same after sync. When you create new items in VCO, you can specify folder of the item. By default, it will be created in the primary folder. 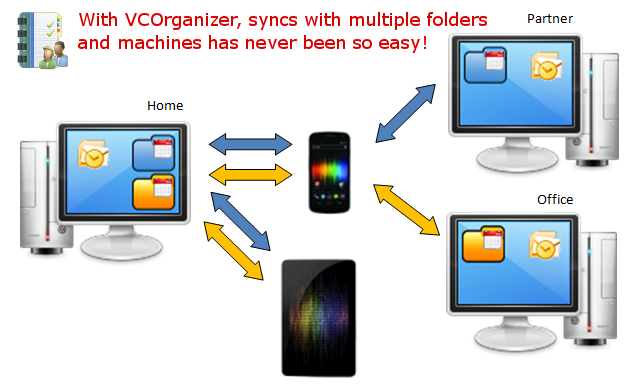 All items created in the primary folder will be synced to all the synced machines. If you don't want to create the item in the primary folder, you can change it to other group. The item will be synced to your Outlook clients based on the linked folders in the group. In VCO Settings, you can set the default folder . In VCO Calendar Settings, you can select which group you would like the items to be created on when importing events from Android Calendar App. Then, these items will be synced to your Outlook clients on different machines depend on the linked folders in the group. In VCO Contacts Settings, you can select which folder group you would like to the items to be created on when importing contacts from Android Contacts App. Then, these items will be synced to your Outlook clients on different machines depend on the linked folders in the group. You can sync between Office 2003, 2007 and 2010 Outlook clients. When item is deleted from one Outlook clients, that item in VCO will also be deleted after sync. When you sync with other PC, the corresponding item will also be deleted (if you have selected "Remove Deleted Items from Outlook" in SyncCenter->Sync Options on those PCs). When category is deleted from Outlook clients, that category will not be deleted from VCO. It also will not be deleted from other Outlook clients. The category in VCO will only be deleted when category is deleted from all the synced Outlook clients. If you deleted the category from VCO manually, the category will be deleted from all the linked Outlook clients after sync (except Office 2003). In Office 2003, categories will be copied from Outlook to VCO. But if you edit the categories in VCO or delete the categories in VCO, it won't sync back to Office 2003 client. This is because categories in Office 2003 doesn't have a internal reference ID so that there is no linkage after sync to VCO. However, in Office 2007 and 2010, you don't have this issue. The categories will be synced in both directions. In this example, you will sync items between Outlook default Calendar folder in Home PC to the Outlook default Calendar folder in Office. Any updates, deletes on one of the Outlook client will be synced to the each other. In this example, there are two groups, Primary Group and Business Group and this is a two-way sync. Example 3: Sync items between two Outlook clients, one of them syncs from PC to phone only. In this example, there are two groups, Primary Group and Business Group. Sync between Home PC and VCO is two-way but sync between VCO and Office PC is from PC to VCO only. VCO will contains events on both PCs. Events will only be synced from Office PC to Home PC. 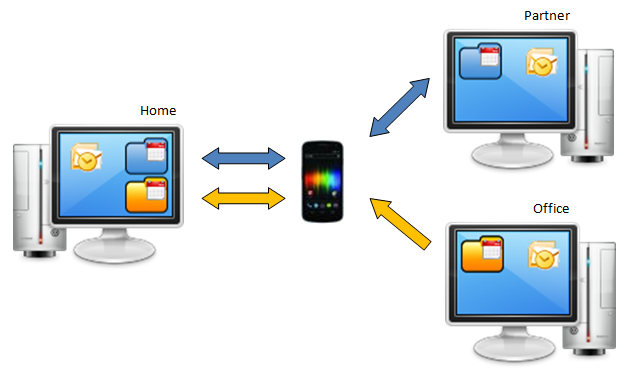 Example 4: Sync items between three Outlook clients, one of them syncs from PC to phone only. In this example, there are two groups and three PCs, Primary Group and Business Group. Events are synced in both directions in Primary Group between Home PC and Partner PC. Events in "Business Events" group are synced from Office to Home PC only. In this example, there are two groups, three PCs and two devices, Primary Group and Business Group. Events are synced in both directions in Primary Group between Home PC and Partner PC. 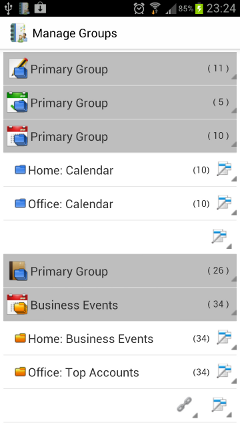 Events in "Business Events" group are synced in both directions between Office to Home PC. 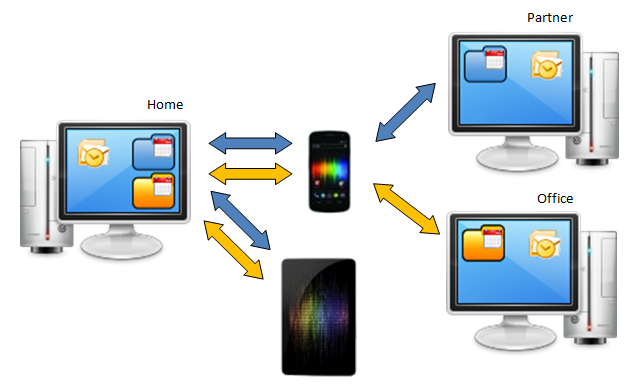 Events in Home PC "Business Events" and default folder will also be synced to tablet.